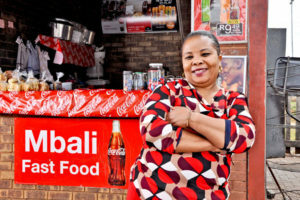 It’s 4 a.m. and while her children sleep, Angel is already up baking scones and cake while simultaneously whipping up beef and chicken stews—all to be sold by her mother, 49-year-old entrepreneur Mbali Luvuno, who will open the family shop at 8 a.m. Located at a taxi stand in Vosloorus community, close to Johannesburg, South Africa, “Mbali’s Fast Food” catering and takeaway offers sweets, snacks and home-cooked lunch meals to drivers and commuters alike. Without understanding how to price items profitably or track business records, at one point Mbali struggled and considered closing her shop. Things changed when she was invited to participate in the business skills training run under a UN Women program to empower women economically and conducted in partnership with The Coca-Cola Company (TCCC) as part of the company’s 5by20 initiative to integrate women into its value chain. She received training on record-keeping, managing income and expenditure, marketing and competition. Not only did Mbali become a more successful businesswoman as a result, but she gained her confidence back. She now dreams of creating a second shop in a larger taxi stand area and handing over her first business to her daughter. “Now I am a proper business woman,” Mbali says. 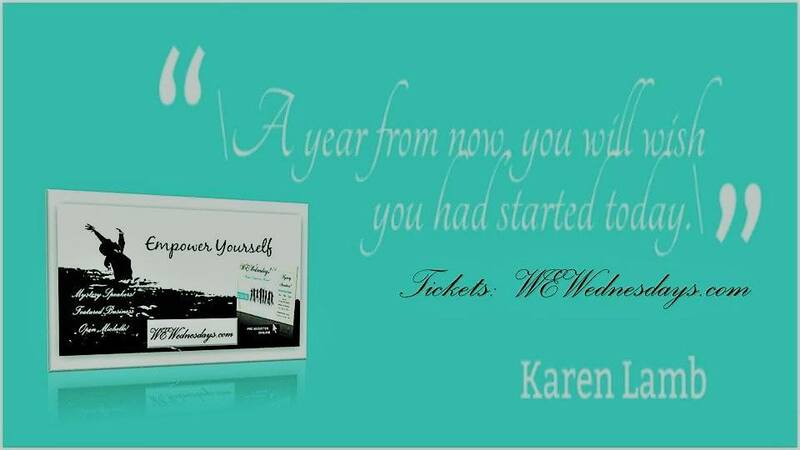 “I know how to keep track of income and expenses and my profit has increased. With the salary I am paying myself, I could expand my house which now has 6.5 rooms,” she proudly adds. Mbali is one of close to 24,000 small business owners in South Africa who have benefited from training through the joint program. Launched in 2013, it has provided women entrepreneurs with the necessary skills and equipment to initiate and successfully manage their businesses. The program has empowered a total of more than 43,000 women in Brazil, Egypt and South Africa, with a focus on disadvantaged and excluded communities. On 12 May, Mbali shared her story with representatives attending the program’s annual Steering Committee Meeting, who came to see her at her shop. The meeting was both a chance to visit and hear from beneficiaries, assess the program’s achievements and discuss lessons learned. 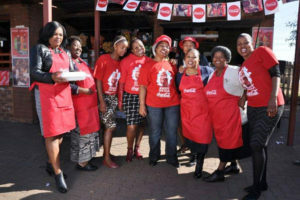 Another woman visited was Joyce Mahlakwane, a 46-year-old widow and mother of three who owns a tuck shop, which was struggling prior to her participation in the business training courses. 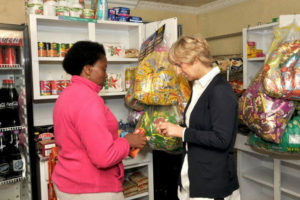 She can now afford to pay her children’s school fees and she plans to expand her tuck shop, invest in more stock and convert it to a mini supermarket. She also mentors other unemployed women in the community who are interested in starting their own businesses. An independent study commissioned by TCCC and conducted by IPSOS revealed that average personal income increased by 23 per cent and average business sales increased by 44 per cent over one year. Filed Under: AFRICA, FEATURED, SPECIAL FEATURE, WOMEN & CAREERS, WOMEN & CAREERS, WOMEN GENDER EQUITY ISSUES Tagged With: A Celebration of Women, acelebrationofwomen.org, African women, Coca Cola, entrepreneurs, entrepreneurship, female entrepreneurs, partnership, South African women, Successful in South Africa, UN Women, woman, women.